Like Merchant Ships: Guess who's coming to dinner? The author of 4 Reluctant Entertainers! ...invited her over for dinner! I am not kidding when I say the house is a wreck. 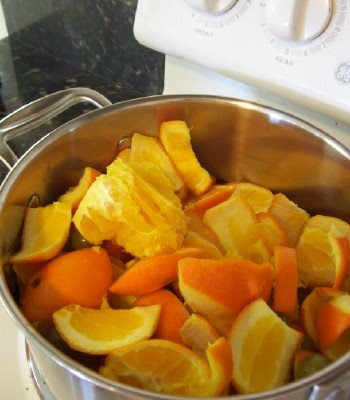 Let's hope simmering these orange peels will mask last night's burned rice! I blitzed through Kroger this morning, ready to choose a menu based on what's on sale. 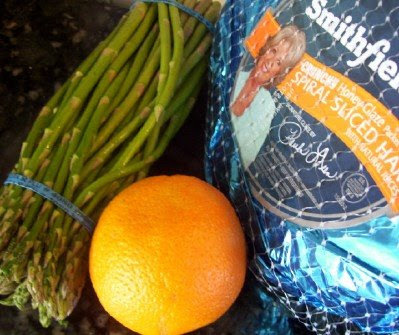 Asparagus ($2/bundle), blueberries (99-cents), and the last Paula Deen ham marked down to 99-cents/lb. My husband will love that leftover ham while I'm speaking at the conference! I splurged on a bundle of orange spray roses (reduced to $4). Perfect excuse to pull out those church sale placemats and yard sale Wedgwood! Thrilled to see these thrifty finds come together--and especially to welcome a new friend. Even if it means moppping the floor! Gorgeous! Can you save me a place?!! See you/meet you tomorrow!!! Your table setting is beautiful. Hope y'all have a great time of fellowship. Sounds like a delicious menu. mmm...yummy menu and yummy placesetting. Love the orange roses! That is so great! I love her blog ALMOST as much as I love yours. But not quite! Have fun and post pics!!! It all looks delightful. I like the way the placemats and roses bring out the color on the inside of the china cabinet. What a lovely table! You never cease to amaze. I am SO jealous of everyone attending Blissdom. I know it will be a wonderful time! Welcome to, "How I felt when I visited your house!!" How exciting! I love both your blog and Sandy's. Y'all have a great time! Sounds like fun! I would be nervous to entertain her, too, but I'm sure you will do great and have a wonderful time. Look who's on board now, Meredith! You are speaking at the conference? Very cool. It is so weird to see blogging friends meet in person!! Everything looks lovely, Meredith. Have a wonderful time this weekend and give lots of details after! I hope y'all have a great time together and at the conference! I think you'd said a while back that you're speaking. What is your topic? Is the wedgwood plates the brand or is that the style? If not the style do mind sharing these plates are beautiful! I love white plates. Especially ones with embossed edges like these. And what a price for a smithfield spiral ham. Boy are they yummy! Have a wonderful weekend! I'm sure that you, your family, and your home will be a blessing to Sandy, mess or no mess! Your table is so pretty!! And I bet dinner will be lovely. Now I am just so jelouse of you girls who are going to the conference. I soooo wish I were going as well. I hope there is one every year so I can meet y'all next year. I don't even know you and yet I think of you each time I'm at the thrift store..."Hmmmm...what would SHE do?" lol. Thanks for sharing...it's always fun to see what you come up with. Have a great time! Oh my have fun! I would love to sit with Reluctant Entertainer for dinner!!! Enjoy! 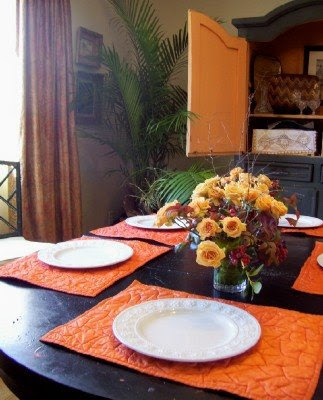 I love all the orange color - great for this time of the year when everything is rather dull and gray! Oh, now that is going to be fun! I just love Sandy & can't wait to meet you both this weekend. I'll be leaving bright & early Friday a.m. See you then! How lucky she is!! I would love to get a chance to meet you. It looks beautiful- I can't wait to meet you, Meredith, and hug you in person! We are going to have so much fun!! Everything looks beautiful! Enjoy Sandy tonight and don't worry. You're my first winner in the BlissDom jewelry giveaway on my blog!! Be sure to post more pictures!! That wedgwood was our wedding china--used as "everyday" china, of course. You're dining room is so beautiful. It looks just beautiful! .99 blueberries! Lucky you! Have a wonderful time at the conference! Y'all, it was really fun! Sandy is not only a gracious host, but a gracious guest as well. I wish you could have been flies on the wall. I seized the chance to ask her step by step questions about what she would do if she were having a dinner party in MY house! I think she should charge for this kind of expertise! I want to write up our evening but it will have to wait until after the conference is over. Last night I got to meet Nester and Emily and Jen from Beauty and Bedlam...and today even more of my favorite bloggers. Seriously, Meredith, having either one of you at my house for dinner would be the equivalent to Martha Stewart showing up unannounced to check my bathrooms for cleanliness. I would have total stagefright! But you two are entertaining superheroes - so I'm sure it will be FANTASTIC! Now, if we could just all be flies on the wall . 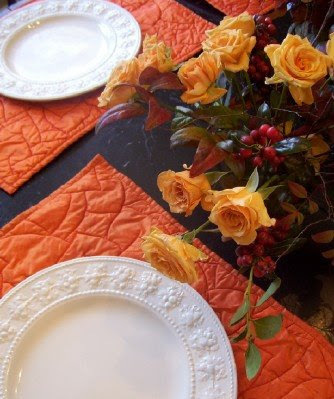 . .
Love the table - the placemats look great with the roses! And that asaparagus looks great for $2 a bundle! Hi. I'm stopping by because of Sandy. She posted about what a lovely hostess you were and had all these wonderful things to say. I had to check it out for myself. I will have to say, she didn't lie. Hi I came from The Nester via 4 reluctant Entertainers. She had pics from dinner at your house with much beauty and Legos. I just had to come over - we ate with Legos tonight too, but not so much beauty. Something to aspire to! That is such a beautiful table!